The oil and gas directional and horizontal drilling industry has an abundant—and sometimes conflicting—vocabulary. To lessen possible confusion, let the following terminology be defined within the context of makinhole.com. *removea superscript that denotes a planned well path value. 3D directional wellremovea directional well with a planned hole section that is not vertically-planar; azimuthal turn exists for one or more segments of the planned well path. 3DStratBlockremovea single planar surface with perpendicular (stratigraphic) thickness that mathematically represents the 3D location of a geologic marker/bed over a MD interval of wellbore. 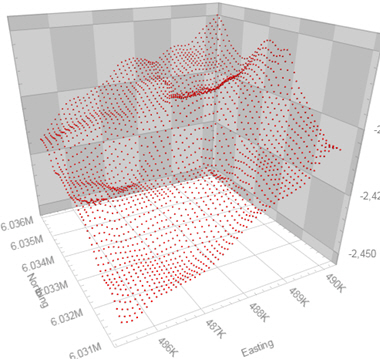 actual well pathremovea best estimate of where a wellbore exists in 3D space, as computed with directional survey data and the industry-standard survey calculational method known as minimum curvature. angular deviationremovethe components of Technical Hole Deviation that address differences between actual and planned angular wellbore properties; includes ID, RCID, AD, and RCAD. automated directional drillingremovedirectional drilling with a system possessing a drilling mode whereby "steering actions" are automatically determined and frequently and automatically changed/controlled while drilling. The system controller software addresses angular deviation AND lineal deviation. Thus, the system controller software temporarily assumes the role of a traditional directional driller and can automatically try to be "on inclination" AND "on depth". Average Absolute ADremoveaverage absolute value of azimuthal deviation associated with real survey stations over the length of drill hole for which a THD log was created. A smaller value usually indicates better directional control performance. Average Absolute HDremoveaverage absolute value of horizontal deviation associated with real survey stations over the length of drill hole for which a THD log was created. A smaller value usually indicates better directional control performance. Average Absolute IDremoveaverage absolute value of inclinational deviation associated with real survey stations over the length of drill hole for which a THD log was created. A smaller value usually indicates better directional control performance. Average Absolute VDremoveaverage absolute value of vertical deviation associated with real survey stations over the length of drill hole for which a THD log was created. A smaller value usually indicates better directional control performance. 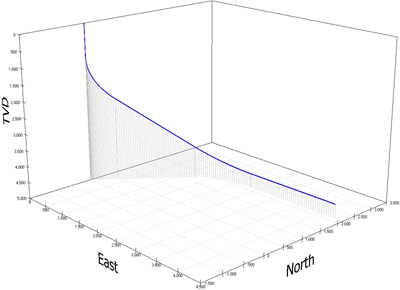 azimuthremovethe angle of the wellbore tangent direction as projected to a horizontal plane and relative to North. By industry convention, 0° azimuth coincides with North, 90° azimuth with East, 180° azimuth with South, and 270° azimuth with West. azimuthal dataremoverefers to downhole formation evaluation well log data (e.g., gamma radiation, resistivity) that is measured and then associated/binned to its respective sector about the bore hole. Common sector counts include 4, 8, 16, and 32.
azimuthal deviationremovethe difference in azimuth between actual and planned well paths, typically at a specific measured depth. Same as AD. Boolean setremovea mathematical concept whereby the degree to which an element belongs to a particular notion about some domain of definition is classified as completely true OR completely false. For example, consider the domain of all room temperatures; 76.2° Fahrenheit either is a member of the set of "comfortable room temperatures" or the set of "warm room temperatures" but not both. Set membership is exclusive and depends on where the Boolean set boundary is defined; move an infinitesimal temperature amount from the boundary and membership fully flips on/off between adjacent sets. buildremovedrilling directionally with the intent to increase wellbore inclination; also refers to increasing and orienting lateral bit force magnitude to or towards the high side of the drill hole. cognitive mapremovea sketch that presents a causal picture of the association of components within a complex dynamic system, for the primary purpose of better understanding dependency relationships and general cause/effect. complex directional wellremovebasically same as 3D directional well but often with four or more planned hole sections after the first KOP and comprised of multiple build/drop gradients, multiple turn-left/turn-right hole sections, and/or concurrent build/drop|turn-left/turn-right hole sections with or without intermediate connecting tangent hole sections. For example a complex directional well can allow for horizontal drilling effectively beneath the rig's surface location. control parametersremovenumeric values that are internal to controller design and directly affect the output of the controller. Control parameters must be "tuned", that is, determined by iterative experience, in conjunction with a subjective goal or a quantitative metric about system performance. controllableremovea general term given to a system component for which the control thereof is direct. For example, consider driving an automobile with a manual transmission. Gear selection, the gas pedal (accelerator), and the brake pedal are examples of controllables while speed is an observable. controllerremovean algorithm/function that maps input to output, usually implemented in the form of computer software for the purpose of controlling a device. curveremovethe planned or actual hole section that connects the vertical portion to the landing point. departureremovethe (horizontal) distance from the surface location to a point along a well path as projected into a horizontal plane at surface. directional control performanceremovea subjective term or quantitative measure related to overall DLS-variance and the "closeness" of drilling along a planned well path trajectory. directional drillingremovethe field/industry that encompasses the act of drilling a section of wellbore that is intentionally oriented non-vertically; horizontal drilling is a subset of directional drilling. directional plan viewremovea plot that displays (North/South, East/West) Cartesian coordinates of a well path projected to a horizontal surface plane; also known as map view. directional surveyremovea summary of geometric information—calculated with directional survey data and a directional survey calculational method (e.g., minimum curvature method)—that pertains to spatial properties (e.g., Cartesian coordinates) of a well; sometimes synonymous with directional survey data or directional survey station. directional survey dataremovetypically refers to the "raw" data acquired at a directional survey station, namely, wellbore/tool inclination and azimuth at specific borehole depths. directional survey stationremovea reference point that corresponds to a measured depth along the (typically actual) well path where wellbore inclination and azimuth are observed/measured and recorded. directional vertical section viewremovea plot that displays vertical section versus true vertical depth of a well path. Vertical section is the horizontal distance (departure) of a well path projected onto a vertical plane of specific azimuth. 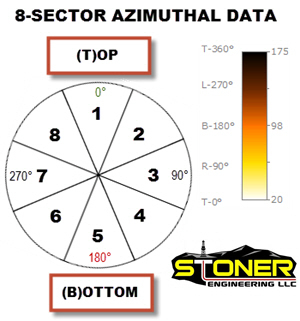 The specific azimuth may coincide with the plane defined by surface to planned TD or it may be chosen to match the dominant azimuth of the lateral hole section. directional wellremovea wellbore created by drilling directionally. drilling directionallyremovethe process of drilling a wellbore with sustained and proactive attention to a preferred path; such preferred trajectory comprising non-vertical hole sections. dropremovedrilling directionally with the intent to decrease wellbore inclination; also refers to increasing and orienting lateral bit force magnitude to or towards the low side of the drill hole. Excess Measured Depthremovethe amount of actual hole drilled subtracted by the corresponding planned measured length of drill hole. This value is reported on a THD Well Log header. FDDCremove Fuzzy Logic Drilling Direction controller; directional steering guidance. Fuzzyremovea general term that refers to a system or methodology that to some degree employs the use of one or more Fuzzy sets. Fuzzy controller, Fuzzy expert system, and Fuzzy neural net are three such example systems. Fuzzy Logicremovean extension of classical Boolean logic that uses Fuzzy sets rather than Boolean sets; is based on rules of the form "if … then …" in which inputs convert outputs based on "degrees of truth". Fuzzy Logic controllerremovea rule based methodology in which system inputs (observables) are systematically and mathematically related to system outputs (controllables). A Fuzzy controller is a highly non-linear function. In the common engineering sense the formulation of a Fuzzy controller is not model based; that is, the rules that govern the controller are not necessarily derived from a physics-based model of the system. Rather, the designer describes in approximate or vague terms the relationships between quantities thought or desired to hold true. There is nothing fuzzy about the logic itself; it is the words, represented with Fuzzy sets, that are ambiguous or uncertain. With Fuzzy logic a controller may be designed to employ experience and common sense knowledge, since rules-of-thumb exist mainly in the form of linguistic statements that are usually, but not always, true. Fuzzy ruleremovea logic statement that associates Fuzzy set input to Fuzzy set output. For example, If <Error> is [Near_Zero], Then <DStabilizer_Force> should be [No_Change]. Here, [Near_Zero] is a Fuzzy set that describes the observable <Error> in the vicinity of zero. [No_Change] is a Fuzzy set that describes the controllable <DStabilizer_Force> in the vicinity of zero. Fuzzy setremovea mathematical concept whereby the degree to which an element belongs to a particular notion about some domain of definition is classified as completely true (1), completely false (0), or partially true and partially false ([0-1]). For example, consider the domain of all room temperatures; 76.2° Fahrenheit may be a member of the set of "comfortable room temperatures" to a degree of 0.45, and also of the set of "warm room temperatures" to a degree of 0.55, depending on where the Fuzzy sets (also called degree of membership functions) are defined. The mathematical manipulations of Fuzzy sets—Fuzzy Logic—are not vague. geosteering (1)removedrilling a horizontal wellbore that ideally is located within or near preferred layers of rock. geosteering (2)removeinterpretive analysis—performed while drilling or after drilling—that determines and communicates a wellbore's stratigraphic depth location in part by estimating local geometric bedding structure. grid dataremovea dataset comprising a digitized estimate of a geologic surface over a drilling area. Sparsely-distributed source/control samples from where wellbores penetrated the surface are input into gridding software and a complete surface estimate over the area is calculated and therewith predict attributes of the surface between the hard samples. A common gridding method used in oil & gas analyses is Kriging (Gaussian process regression). Grid data are aggregated using a global coordinate system in order to merge multiple individual-well data sources. X, Y, Z are normally GridX, GridY, and TVDss based on a preferred map zone projection for the project/field (e.g., NAD27 UTM 13 N Feet). HAHZremovea high angle (HA) or horizontal (HZ) well type, meaning wellbore inclination exceeds ≈60° for HA or exceeds ≈80° for HZ; sometimes seen as HaHz. Some horizontal wellbores exceed 110° inclination at TD. hole deviationremovesame as Technical Hole Deviation and should not be confused with general drilling "hole deviation", which attempts to explain/model why a wellbore can't economically be drilled in a continuously-straight direction. hole deviation logremovea well log that conveys the directional well plan, and the associated geometric deviations between the actual well path and the directional well plan. horizontal deviationremovedefines how "left" or how "right" the actual well path is relative to the planned well path location and orientation; is easily-visualized with a sketch and matches directional driller common sense. Same as HD. horizontal drillingremovedrilling directionally at a wellbore inclination angle exceeding ≈80°. Some horizontal wellbores exceed 110° inclination at TD. Horizontal THD Logremovea hole deviation log that includes the components of Technical Hole Deviation that address hole deviation in the horizontal sense, namely, HD, RCHD, AD, and RCAD. image logremovea colored image that presents azimuthal well log data; color represents a scalar value, one axis represents MD, and the other axis represents azimuthal location/sector about the bore hole. The center of the image and parallel to the MD axis represents the bottom (low side) of the bore hole while the edges coincide with the bore hole top (high side). inclinationremovethe angle of the wellbore defined by a tangent line and a vertical line. The vertical line is parallel to the direction of earth's gravity. By industry standard, 0° inclination is vertical (downward pointing) and 90° inclination is horizontal. An inclination (angle) greater than 90° coincides with the term "drilling up". inclinational deviationremovethe difference in inclination between actual and planned well paths, typically at a specific measured depth. Same as ID. KOPremovekick-off point; the MD where the wellbore is purposefully deviated from its prior—usually vertical—orientation. landing pointremovethe MD or its close proximity where planned wellbore inclination becomes constant and the lateral hole section begins. lineal deviationremovethe components of Technical Hole Deviation that address differences between actual and planned lineal (linear; relating to lines) wellbore properties; includes VD, RCVD, HD, and RCHD. local coordinatesremoveCartesian coordinates North, East, and True Vertical Depth (TVD is positive down) which are all zero at MD=0. Most often in the USA, MD=0 at kelly bushing reference elevation, which is about one foot above drilling floor elevation; both of which are above ground level elevation and depend on the specific drilling rig substructure height. map viewremove projection of a well path onto a horizontal plane at surface; same as plan view. observableremovea general term given to a system component for which there is no direct control thereof, but the value of such component provides pertinent information about the state of the system. For example, consider a heating and cooling system for an enclosed football stadium. The current temperature at a specific location within the stadium is an observable. plan viewremove projection of a well path onto a horizontal plane at surface; same as map view. planned well pathremoveas a function of measured depth, the Cartesian coordinates, inclination, and azimuth that define the preferred spatial existence of a wellbore. The planned well path can be piece-wise continuous, meaning it can change abruptly as a result of new information acquired while drilling (e.g. from geosteering after crossing an unknown fault). relative stratigraphic depthremovea stratigraphic depth distance that is relative to a reference marker. RSD is oriented perpendicular to bedding and RSD=0 is usually chosen to be at the top of a payzone. rotary steerableremovea directional drilling system comprising a downhole-adjustable tool located within the bottom hole assembly that allows for lateral force (magnitude and orientation) control close to the drill bit while drilling and while rotating the drill string. RSSremoverotary steerable system; see rotary steerable. section viewremovesame as directional vertical section view. stratigraphic depthremovea depth that is perpendicular to bedding plane orientation. survey stationremovesame as directional survey station. TDremovetotal depth; the measured depth at the current end of a well path. Technical Hole Deviationremovea quantitative description of how a directional wellbore trajectory differs from its planned trajectory; mathematically ties a directional well plan to its actual well path. Eight variables collectively define technical hole deviation. Not to be confused with general "hole deviation", which attempts to explain/model why a wellbore can't economically be drilled in a continuously-straight direction. Technical Hole Deviation Technologyremovea general term that refers to using THD to rationalize directional control actions while drilling, to monitor directional progress as a directional well is drilled, to evaluate driller or service company directional control performance, or to enable generation of specialized wellbore cross sections in the MD domain. THD Well Logremoveeither a Vertical THD Log or a Horizontal THD Log. tool settingremoverefers to directly controllable settings of a directional drilling tool located in a bottomhole assembly; for example, the net pressure-area force acting at a specified angle in a rotary-steerable adjustable stabilizer. trajectoryremovesame as well path, actual or planned; the traverse that defines the actual or preferred existence of a wellbore via spatial properties. turnremovedrilling directionally with the intent to change (increase or decrease) wellbore azimuth. type logremovea quantitative dataset of signal (e.g., gamma ray, resistivity) versus StratDepth that provides stratigraphic correlation guidance and is normally sourced from a non-horizontal well or derived from a horizontal well that initially was correlated from a non-horizontal well source. vertical deviationremovedefines how "high" or how "low" the actual well path is relative to the planned well path location and orientation; is easily-visualized with a sketch and matches directional driller common sense. Same as VD. vertical sectionremovethe horizontal distance (departure) of a well path as projected onto a vertical plane of specific azimuth. 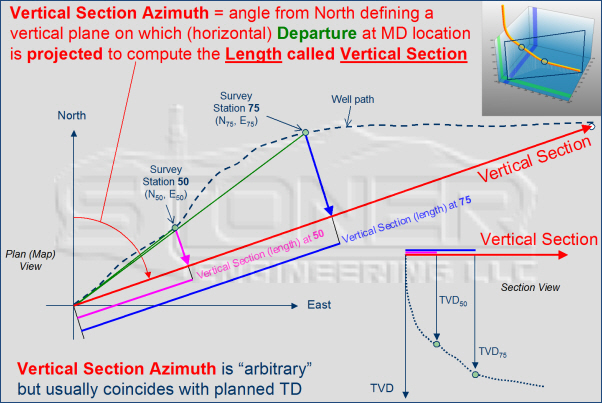 vertical section azimuthremoveangle from North defining a vertical plane onto which (horizontal) departure at MD location is projected to compute the length called vertical section; may coincide with the plane defined by surface to planned TD or it may be chosen to match the dominant azimuth of the lateral hole section. Vertical THD Logremovea hole deviation log that includes the components of Technical Hole Deviation that address hole deviation in the vertical sense, namely, VD, RCVD, ID, and RCID. well pathremoveactual or planned trajectory defined by Cartesian coordinates, and by angular orientations/properties.